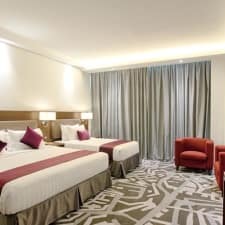 Located in the vibrant shopping district of Kuala Lumpur city, WP Hotel offers well-appointed, contemporary accommodation within walking distance of shopping, dining and sightseeing. Rooms and suites feature modern decor and include en suite bathrooms, flat-screen TVs, free Wi-Fi, minibars, safes, and tea and coffeemakers. Some rooms offer city views. WP Hotel features a rooftop pool which offers guests with stunning views of the city. There's also a gym, a shared TV lounge and five meeting rooms. Concierge services, laundry facilities and luggage storage are available. Wi-Fi is accessible freely throughout the hotel. The staff is multilingual. Limited on-site parking, and 24-hour security is available. Lemongrass cafe is an all-day restaurant serving Malaysian, Chinese, and Western cuisine. There are many eateries nearby. The Petronas Twin Towers and Suria KLCC are both less than a mile from the hotel. Berjaya Times Square is two miles away.